BOSTON – Governor Charlie Baker and Transportation Secretary and CEO Stephanie Pollack today joined state and local transit officials, federal and state elected leaders, and community partners today to celebrate the groundbreaking of a $38.5 million improvement project to the MBTA’s Ruggles Orange Line and Commuter Rail Station. 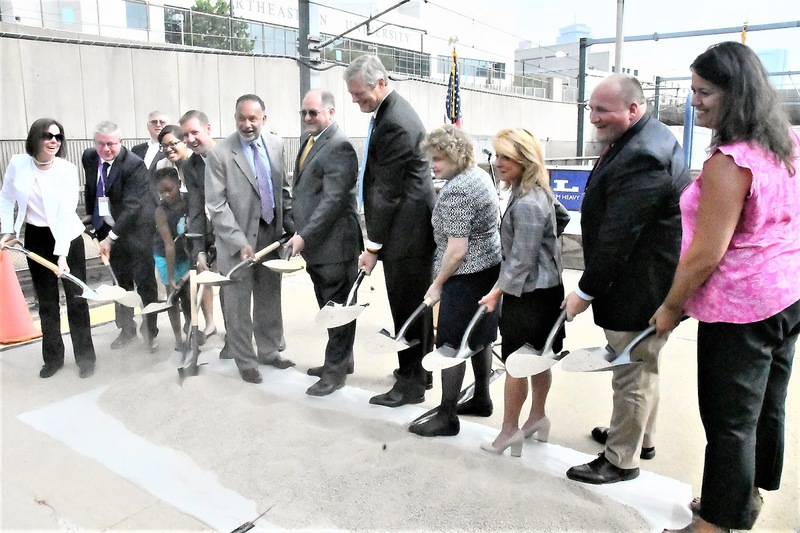 The new station includes elevators, a reconstructed lower busway, and a brand new 800-foot Commuter Rail platform to better service Track 2 and increase capacity for nearly all inbound commuter rail trains to stop at the station. A contract first authorized in March 2012 that included the layout and design of a brand new 800-foot Commuter Rail platform to service Track 2 was amended by the MBTA’s Fiscal and Management Control Board (FMCB) last December to include ADA improvements, a reconstructed lower busway, and new elevators. Currently, approximately 30% of inbound trains bypass Ruggles due to physical limitations of the current platform and daily congestion along the corridor from MBTA and Amtrak trains. 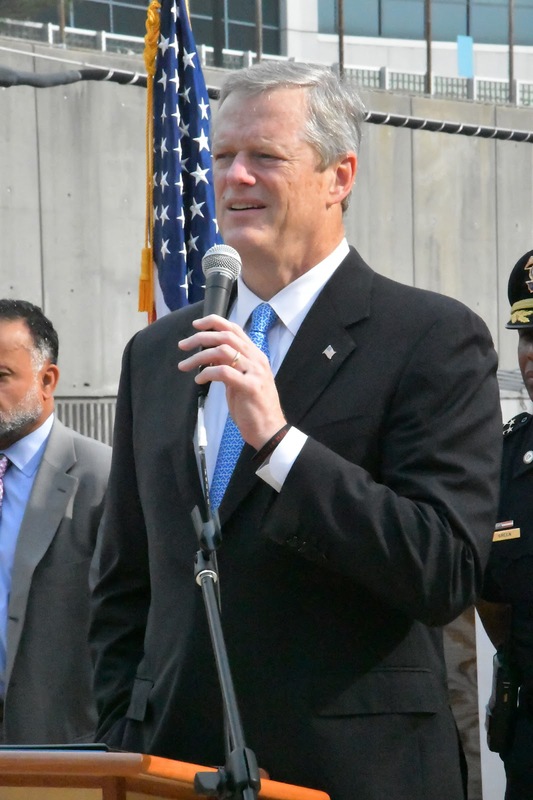 Construction will increase the size of the existing platform and improve the infrastructure in keeping with ADA guidelines to allow improved access to the neighboring community that includes the Longwood Medical and Academic Area, which is the largest employment center near Ruggles Station, and Northeastern University (NEU). A total project cost of $38.5 million is supported by a $20 million federal Transportation Investment Generating Economic Recovery (TIGER) VI Grant awarded in October 2014, federal FTA funding of $6.8 million and state funding of $11.7 million from the MBTA Revenue Bond fund. With the design phase completed in January 2017, construction is scheduled to be performed from 2017 through 2019. 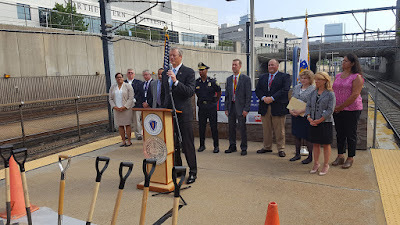 Governor Baker and Secretary Pollack were joined by MBTA Interim General Manager Steve Poftak, Keolis Commuter Services CEO and General Manager David Scorey, Congressman Mike Capuano, State Representative Chynah Tyler, Boston Transportation Department Commissioner Gina Fiandaca and Northeastern University Senior Vice President and General Counsel Ralph Martin. After close coordination between the MBTA and NEU due to NEU’s close proximity to the project, NEU plans to construct a pedestrian bridge over the tracks, providing access from Columbus Avenue to NEU’s main campus and surrounding areas. NEU will also relocate a power duct bank and construct approximately 300’ of shared wall along their new proposed deck on behalf of the MBTA project. Some of this work has already been completed with more underway. Ruggles Station is a multi-modal station that serves thirteen MBTA bus routes, seven private bus shuttles, the Orange Subway Line, and three Commuter Rail lines (Needham, Franklin, and Providence/Stoughton).